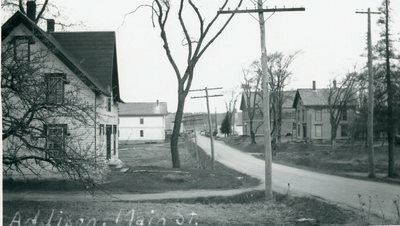 An image scanned from a black and white photograph of Addison, Maine, with the caption, "Water St., looking west toward village center. (Incorrectly ? labeled Main St.) On left: M. H. Brown's house, Masonic Hall. On right: Grange Hall, Melona Gage house. At far end of right side of street is the absence of the burned buildings."